An Australian cattle worker whose thumb was severed by a bull has had his toe surgically transplanted in its position. 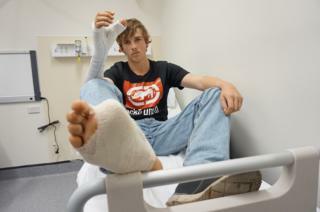 Zac Mitchell, 20, was injured in April while working on a remote farming property in Western Australia. "A bull kicked my hand into the fence," Mr Mitchell said of the incident. He underwent two unsuccessful operations to reattach his thumb before doctors opted to relocate his big toe in surgery lasting eight hours. Mr Mitchell said fellow workers had attempted to preserve his thumb immediately after the accident. "They put it in the esky [cooler] with some ice," he told the BBC. Mr Mitchell was flown to hospital in the state capital of Perth, but efforts to save his thumb ultimately failed. Despite initial reluctance, the cattle worker agreed to the transplant operation at the Sydney Eye Hospital two weeks ago. Lead plastic surgeon Dr Sean Nicklin said he was not surprised it took time to accept. "It is a bit of a crazy idea - they [patients] do not want to be injured in another part of their body," he said. "[However] even if you have got four good fingers, if you do not have something to pinch against them, your hand has lost a huge amount of its function." Mr Mitchell will need more than 12 months of rehabilitation, but he plans to return to farm work. The Sydney Eye Hospital said it was rare to transplant a complete toe, like in Mr Mitchell's case, although partial toe relocations were more common. "A lot of people think their balance and walking is going to be significantly affected which it generally isn't," Dr Nicklin said. Mr Mitchell's mum, Karen, said he was making a good recovery. "Two weeks since the operation his walking is almost back to normal." Doctors say Mr Mitchell should eventually be able to return to his hobby of bull riding.